ECDPM is a leading independent think tank that wants to make policies in Europe and Africa work for inclusive and sustainable development. We provide research, advice and practical support to policymakers, advisors and practitioners in Europe, Africa and beyond. We focus on EU foreign policy and European and African policies related to conflict, migration, governance, food security, regional integration, business, finance and trade. Subscribe to receive the latest news on international cooperation, development and Africa-Europe relations. Aryee, B. N. A. 2012. Contribution of the Minerals and Mining Sector to National Development: Ghana's Experiment. GREAT Insights, Volume 1, Issue 5. July 2012. Maastricht: ECDPM. Mineral commodities give countries possessing them an advantage in their developmental efforts. The sector’s resources and growth can be harnessed as inputs for holistic sustainable development. Mineral commodity policies should therefore ensure that these resources serve as a catalyst for sustainable development, especially non-renewable resources. With a reasonably well-known and attractive mineral resource base, significant mining investment has been attracted into the country over some 20 years of stable multi-party democracy. The mining sector has therefore been an important part of our economy, with gold accounting for over 90% of the sector. 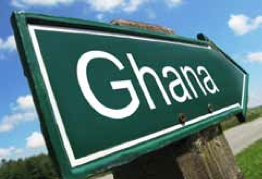 Ghana is the second largest gold producer in Africa and the 9th largest producer in the world. The sector directly contributed 38.3% of Ghana’s total corporate tax earnings, 27.6% of government revenue and 6% GDP in 2011. The sector employs 28,000 people in the large scale mining industry whilst over 1,000,000 people are engaged in the small scale gold, diamonds, sand winning and quarry industries. In 2011, Ghana produced 3.6 million ounces of gold, the highest ever in the history of the country. This resulted in export revenues of over US$5billion. It is significant to note that small scale miners contributed some 28% of the total gold production in 2011. Total Direct Investment (DI) into the minerals and mining sector from 1983 to 2011 amounted to US$ 11.5billion. Beyond direct fiscal receipts, the sector has great capacity when it is integrated into the economy. This is achieved through several channels: additional fiscal revenues from mining-related activities, employment generated by these activities, inputs provision for for other sectors, research and development activities, and technology transfers. Mining has therefore contributed to the state of development of sectors like banking, financial services, transport, logistics, amongst others. Mining also contributes to development through implementation of Corporate Social Responsibility (CSR) programmes for host Communities and the general public at large. In 2011, US$24million was spent on CSR projects by the mining companies. However to fully realize the potential of the sector to contribute to socio-economic development, a number of key challenges have to be addressed, such as inadequate linkages between the mining sector and the rest of the economy and poor diversification of the sector, which is concentrated on gold. The legal framework in which mining operates also faces a number of limitations, first amongst which its capacity to optimize financial benefits and ensure – and demonstrate – fair and equitable distribution of the benefits from mining. Another challenge facing the legal framework around mining is the management of artisanal and small scale mining, especially the menace of illegal mining. This relates to finding suitable areas as well as the creation of awareness among such miners to regularize their operations and to operate legally, efficiently and in an environmentally friendly manner. Recent reforms and strategies have been put in place to address these challenges. Amongst these, the revision of the draft national minerals and mining policy aims at consolidating various policies in the mining sector into the national minerals and mining policy, with “Sustainable Development through Mining” as a guiding principle. It has been extensively reviewed through stakeholder consultation and should be adopted by Government shortly. A number of regulations covering a broad spectrum of issues including, environment, local content, mineral licensing, among others, have also recently been passed by Parliament. A review of the fiscal regime is also under way, through a collaborative approach to optimizing the distribution of the benefits from mining. This includes the establishment of a framework to review legal provisions which appear inequitable and a multi-agency mining revenue taskforce tasked with ensuring effective and efficient collection of revenues and recommending legal policy reviews. We are also working towards managing social issues in the sector. Baseline data on social conflicts has been complied along with policies and guidelines on mine closure and post closure, compensation, corporate social responsibility and the use of mineral royalties by district/municipal assemblies. In terms of increasing linkages and multiplier effects, efforts to increase local content development in mining operations are underway, supported by the International Finance Corporation (IFC). This has included the development of a database on goods & services required by the mining industry; the identification of some local companies with capacity to service mining companies; and the building additional local enterprise capacity. 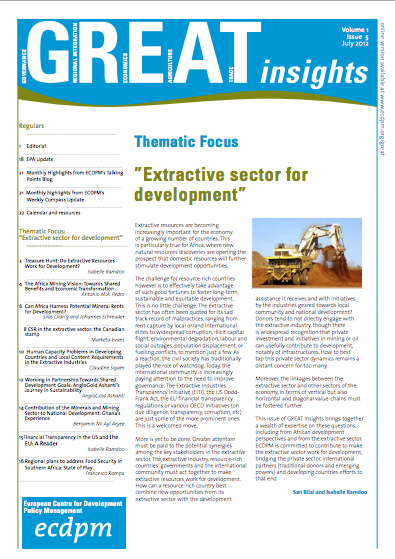 Finally, we are also members and participants in a number of initiative, such as the Extractive Industries Transparency Initiative, the African Union’s African Mining Vision, ECOWAS Directive on the Harmonisation of Guiding Principles and Policies in the Mining Sector of West Africa as well as the Inter-governmental Forum on Mining Metals and Sustainable Development. With the right policies, backed by judicious use of our resources and support from our Development Partners, the mining sector can catalyze sustainable development within a framework of stakeholder collaboration. Ghana is pursuing measures in this respect and which will also lead to development of skills, spawning of other industries and generating the necessary revenues for national development. Benjamin Nii Ayi Aryee is Chief Executive Officer of the Mineral Commission of Ghana. This article was published in GREAT Insights Volume 1, Issue 5 (July 2012). 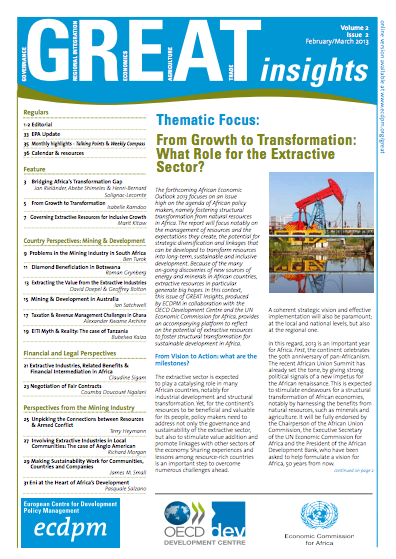 From Growth to Transformation - What Role for the Extractive Sector?